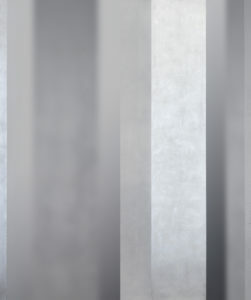 James Harris Gallery | Bing Wright: "Silver/Surface"
James Harris Gallery is pleased to present Silver/Surface, our fourth solo exhibition by New York based artist Bing Wright. Wright’s new work addresses the core concerns of his practice that has evolved over the past thirty years in response to the shifting role of the medium and to the technological developments in photographic process. For this exhibition, Wright takes on surface as subject matter, which has been a leitmotif throughout his career. Since his “Rain Window” series in the late 1980’s, Wright has explored the ontology of the photograph, treating reflective surfaces as subject matter and representing the world as a series of these two-dimensional reflections. 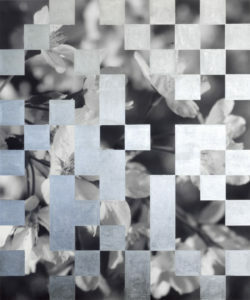 In Silver/Surface, the artist expands on the photographic image and creates composite pictures that incorporate the digital photograph with a handmade silver leaf overlay. In this method, Wright presents two series of works to approach the construction of a surface in different ways, both resisting pictorial depth and challenging a straightforward reading of the photograph. Wright’s conceptual approach to his subject matter and the handmade surface quality of these minimalist works defy the referential fate of the medium as a reproduction and instead suggest a contingency on the activation in real space. Wright has always been fascinated by the correlation between the photo and a mirror, both being silver based picture planes. 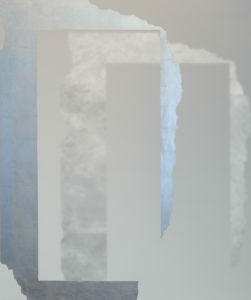 At the beginning of his artistic career, Wright was exposed to the potential of the medium by John Szarkowski’s legendary exhibition Mirror and Windows in 1978, which reconstructed the framework of the photographic image as a two-dimensional pictorial surface into a conceptual space. With a postmodern perspective of the photographic image, the medium expanded into diverse practices that continue to reorient our relationship to photography. Always present in Wright’s work is an acknowledgement to the history of the medium, from its early 19th century pioneers (Fenton, Le Gray, Muybridge) to the postmodern counterparts to the digital age of the new millennium. In response to this next great evolution in the medium, Wright dismantled his darkroom in 2007, acknowledging (or lamenting), “the alchemical magic of the silver based medium was dying a slow death. “ It was then that he created his first series of images of silver itself entitled, “silver prints”. For this exhibition, Wright created large-scale hybrid digital and handmade works of inkjet prints overlaid with silver leaf. 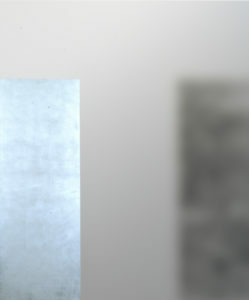 In one series, the artist uses abstract forms of silver such as bands, corners and frames and pairs them with faded images of their own reflection, the digital photograph creating this shadow or afterimage for the silver form. 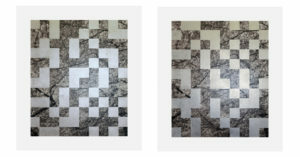 As with the “Silver Prints” the resulting works reveal multiple planes of silver including, of course, the plane of silver itself. Wright’s construction of surface collapses these picture planes into a concise, two-dimensional form and allows the image to function as it itself. The surface is both a reflection and reflective, where meaning and subject are analogous. Also included in this show is a series of work that returns to the artist’s past. 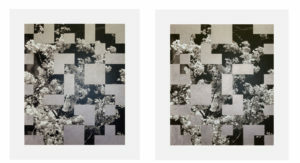 Unearthing some photographs of cherry trees taken by a 35mm lens back in the 1980’s, Wright has similarly applied a geometric abstract overlay of silver leaf that obstructs the image, creating a patterned non-referential surface. This more romantic approach of hiding and revealing plays with our expectation and a desire for the source image. The inaccessibility of the original cherry tree image taken from a pre-digital era as well the abstract ghost image or shadow image of the silver both suggest a nostalgia, perhaps for the physicality of the photographic process of the past and “the alchemical magic of the silver based medium.” This new work, however, presents a more literal form of physicality in Wright’s application of actual silver leaf onto the surface, creating a reflective plane that brings us starkly into the present. More akin to a minimalist experience, Wright’s photographs are contained art objects that speak to the process of their own making while paying tribute to medium’s history. 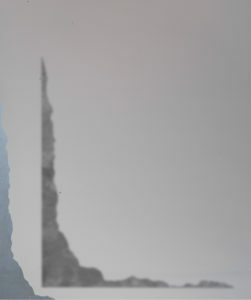 If a photograph is traditionally considered a reflection of a specific moment in time, Wright turns this definition on its head, requiring an activation that unfolds in the present. Bing Wright was born in Seattle in 1958 and received a Bachelor of Arts in Art History from Columbia University, New York. His photographs have been shown in exhibitions at the Tang Museum and Art Gallery, Saratoga Springs (2007), the New Museum of Contemporary Art, New York (1991) and the Queens Museum of Art, New York (1986), among others. His work can be found in several museums collections including the Museum of Modern Art and the Seattle Art Museum. 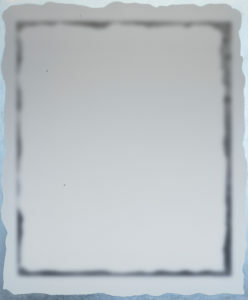 He lives and works in New York City and is also represented by Paula Cooper Gallery. 48 1/4" x 41 1/4"